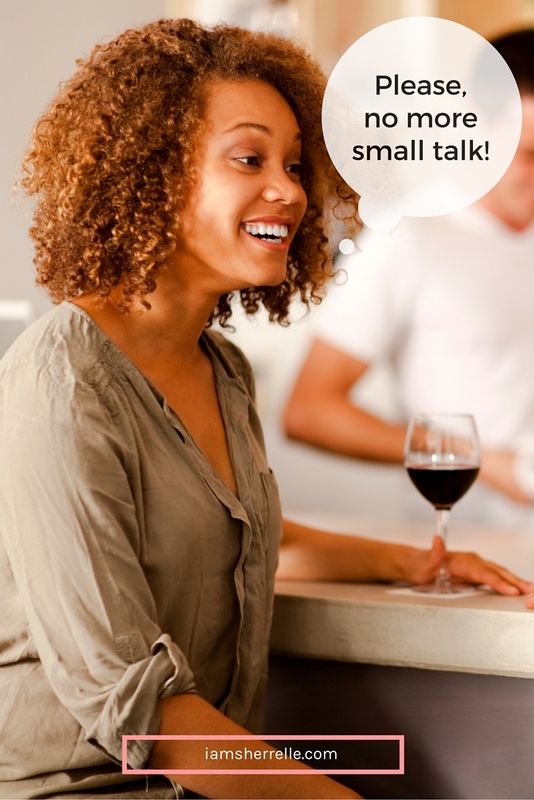 Please, No More Small Talk! This leads to a discussion about the current state of the weather. And the awful state of traffic in bad weather, or any weather because the traffic is just crazy nowadays. Typical, predictable, boring. This type of talk can go on for an hour or more. So you leave a conversation knowing their statistical data – really things that you can google or read on a census report – but did you learn anything important about them? In the case of my coffeeshop mates, how do they even know if it’s worth having a second date? Sadly this type of interaction is not just reserved for strangers; people who know each well, like a committed couple or family, can also fall into this trap of superficial conversation. Think about the daily question that most couples ask each other after a workday apart, “How was your day today?” Many times that question will be answered, “Fine, how was yours?” Or if more details are given they are given in a list format – this happened, then that happened. Neither way fosters intimacy and true connection. A list about what happened does not tell me how you felt about it. Were you jealous when Steve was picked to head up the new project instead of you? Did you shrug when you spilled your coffee or did you cry because even though it was a little thing it was the last straw in an already stressful day? I thought my disdain for small talk was just my somewhat introverted personality and the fact that I’m a pretty intense person. Any pro-longed small talk about the weather or traffic makes me want to gouge my eyes out. Or never talk to you again. But as it turns out, I am not alone. Because of my Facebook post a friend sent me this article by Tim Boomer. 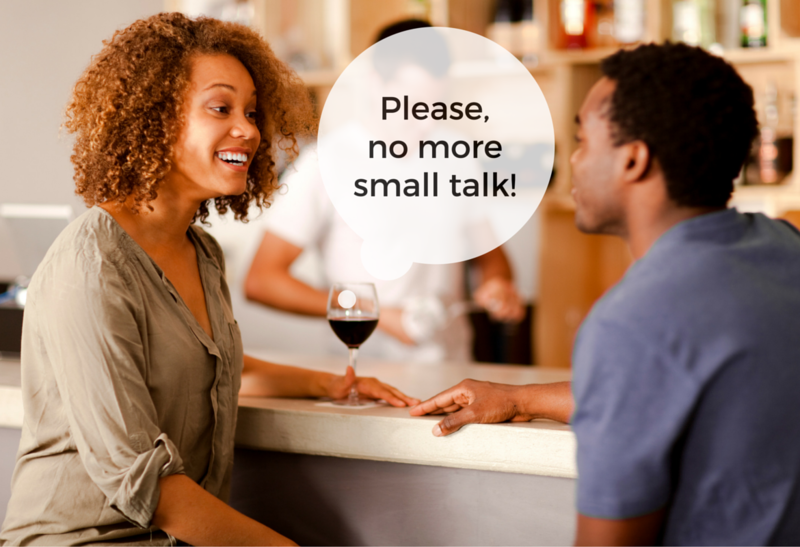 In his The New York Times article, The End Of Small Talk, he explains why he decided to end all superficial conversations after – just like me! – overhearing a first date conversation. I decided to approach my re-entry to dating with a no-small-talk policy. Not that I would insist we talk only about heartfelt subjects; ideally, there would also be plenty of flirtatious joking and witty banter. I simply wanted to eliminate the dull droning on about facts and figures — whether it’s snowing or raining, how cold it is, what we do for work, how long it takes to get to work, where we went to school — all those things that we think we have to talk about with someone new but that tell us little about who the person really is. Big talk. I like big talk much more than small talk. While it’s true that sometimes it’s best to stay away from politics and religion, there are plenty of other ways to get to know someone beyond the superficial. When the inevitable small talk starts, here are a few ways to go deeper. Talk about current pop culture, but in the context of getting to know someone better. If the Oscars are near, asking “What’s the best movie you saw lately?” is better than “Did you see any of the Oscar movies?” – which can be a yes or no answer. Dream and plan together. Remember doing that as a new couple? It’s fun and it fosters intimacy. Play 36 questions on your next date night. Although it was meant to prompt single people to fall in love, the purpose is to create intimacy and even established couples could use more intimacy. Play “Roses and Thorns” eat night at dinner: each family member tells one good thing and one bad thing that happened during their day and how they felt about it. Read the books that you kids are reading for literature class. Not only will you be able to help them if they have trouble, but you can talk about some of the book’s weightier themes and often learn insight into your kid’s understanding of the world. My daughter is reading The Book Thief now and I am reading along with her. As a result we have had some great conversations. Did you notice the common thread throughout most of these questions? It prompts people to tell a story and everyone loves a good story. Recently I saw a parent at a birthday party pick-up. Instead of the usual school/kid/parent small talk, I launched into a funny (not funny) story of my son at the dentist. It was less about the dentist and more about finessing my ever-changing role of mother to a rapidly growing teen. As a writer I think and talk like a storyteller, but everyone has stories to tell, if they can just reach beyond the small talk. So tell your story. Be clever. Be curious. Just please, no more small talk. P.S. You may also like to read 9 Reasons That You May Secretly Be An Introvert.